He rang me up one day and said, ‘Would you like to come and set a project to the illustration students?’ Which… I mean, was a novelty to me; I'd never done anything like that, but I went and… I invented a book cover project which was really… something I really didn't know a great deal about. But… and then you… they did it and you went back a fortnight later, and I went back and did a crit of everything they'd done. And… then Brian said, ‘Just come down to my office, we'll have a few words’. And… he said, ‘Would you like a part-time job here?’ And it took me about, you know, five seconds to decide the answer was yes…which was different from being, you know, Assistant Art Editor of Punch. And I… and I imagine… so I started the next… I was looking forward to starting in that… that autumn, in October, or whenever it was, and… it was strange though, because I thought, a part-time job, it was actually… two days a week, I think… and I didn't know too much about art… I knew something about Chelsea, but I didn't know too much about art schools, and I imagined this was a very, sort of, humble role, in which you came in and did a little bit on a part-time basis, and crept away again. But of course, when I got there, I discovered there were only three people teaching in the department: Brian was one, Sheila Robinson was another, Paul Hogarth used to come in occasionally, and… and me, you know, so… so that in fact you… you were actually part of the… of the team, and… and I really… I mean, I sort of quite soon became Brian's lieutenant, effectively. And… and we kind of ran it between us, and we spent a lot of time talking to each other, I mean he… he was a very well stocked mind, a very interesting person. And so there were just occasions from time to time, when we were in his office, and I'd say, ‘Perhaps we ought to go and see how the students are getting on… on now’. But… and the other thing that was very… I mean, I had to sort of learn how to do it after I got there, really. I mean I had some thoughts about education, which I think were… relevant in fact. I mean, the great trap in education is to do, you know, unto others as was done to you, which is… which is a dreadful mistake. I mean you have… every bit of education is a new situation, and you can… come to it with some experience, but… you have to address that situation, and so it's… it’s different. I mean as it was there, teaching in a postgraduate situation, from… from actually teaching people how to do things. But I sort of had to learn it… after I got there. And I think it was only after a couple of years that I really, sort of, got into the swing… or perhaps after about seven years, I'm not sure, but I mean you… you feel that you do kind of learn how to do it after a while. 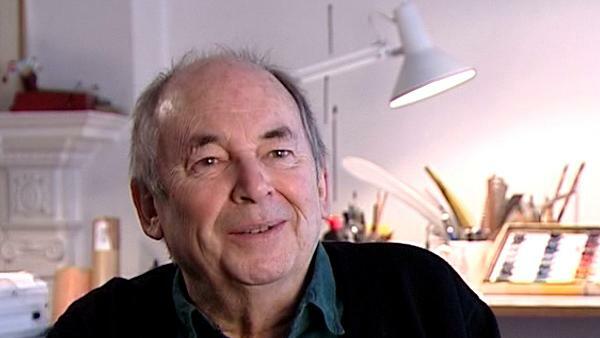 Quentin Blake, well loved British writer and illustrator, is perhaps best known for bringing Roald Dahl's characters to life with his vibrant illustrations, and for becoming the first ever UK Children's Laureate. He has also written and illustrated his own books including Mr Magnolia which won the Kate Greenaway Medal. Ghislaine Kenyon is a freelance arts education consultant. She previously worked in gallery education including as Head of Learning at the Joint Education Department at Somerset House and Deputy Head of Education at the National Gallery’s Education Department. As well as directing the programme for schools there, she curated exhibitions such as the highly successful Tell Me a Picture with Quentin Blake, with whom she also co-curated an exhibition at the Petit Palais in Paris in 2005. At the National Gallery she was responsible for many initiatives such as Take Art, a programme working with 14 London hospitals, and the national Take One Picture scheme with primary schools. She has also put on several series of exhibition-related concerts. Ghislaine writes, broadcasts and lectures on the arts, arts education and the movement for arts in health. She is also a Board Member of the Museum of Illustration, the Handel House Museum and the Britten-Pears Foundation.